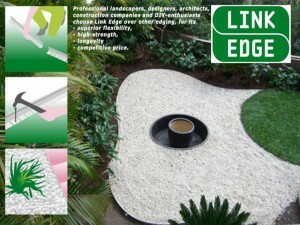 Link Edge is Australia’s Best and Most Reliable Aluminium Gardening Edge. Link Edge’s unique patent and design registered is the superior aluminium edging solution. Link Edge is the only landscape edging you should choose. Cement edging will crack, can be tricky to install and can be time consuming. Steel edging will rust and leave sharp edges. Wooden edging will rot, splinter and attracts unwanted pests. Plastic edging and plastic components will break down and become brittle in the sun. Professional landscapers, designers, architects, construction companies and DIY-enthusiasts choose Link Edge over other landscape edging, for its superior flexibility, high-strength, longevity, most-competitive price, and dependable customer service from a renowned, Australian and family-owned manufacturing company. If you are looking for the perfect professional-finish, choose the only reliable aluminium edge for lawn, garden, paving, greenroofs & bitumen. Link Edge, the Original Australian Aluminium Landscape Edging. Link Edge is designed and made with durable, high-quality aluminium and allows for complete flexibility. Link Edge is the most competitively-priced garden edging available and offers the most value for money every time. It is time-saving and a long-lasting metal landscape edging solution that can be used to form straight, curved, angled and circular-edges with ease, no expertise needed and the best results available of any garden edging.